Stage coaches vanished with the advent of trains, and trains were followed by cars and buses. They were much faster than a coach and an efficient way to travel. This meant people who were not wealthy could actually take a trip for fun, enter the tourist with a suitcase.The first suitcases were actually cases for suits and marketed to traveling gentlemen. 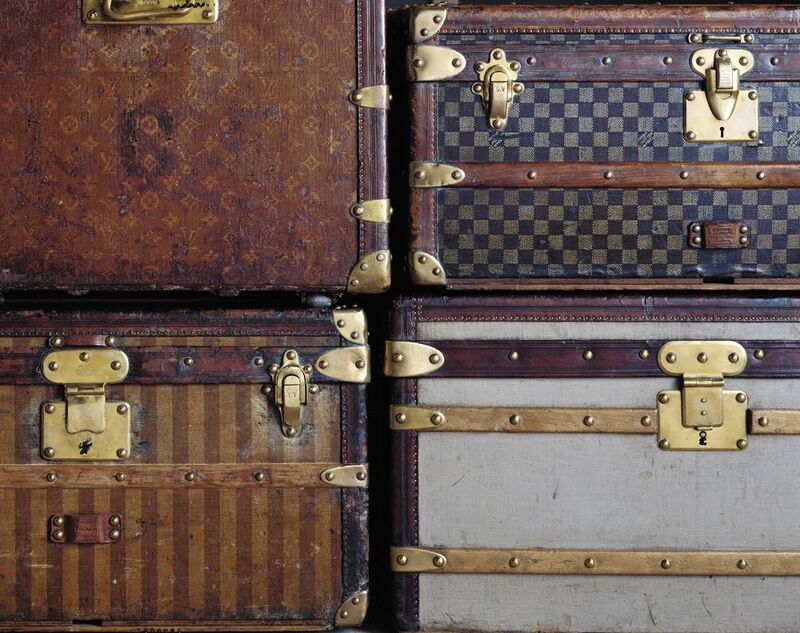 Back in the 1920's and 30's, matched luggage as in suitcases, was a luxury and at first available only to the rich. Most luggage was made from thin but sturdy wooden framed boxes covered in cowhide which could be stained many different leather colors. Everything was hand stitched and lined in silk and canvas. Lots to choose from in this 1940's ad. 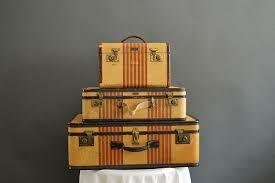 The average cost of one piece of bespoke luggage during the 30's and into the late 40's was about $350.00. 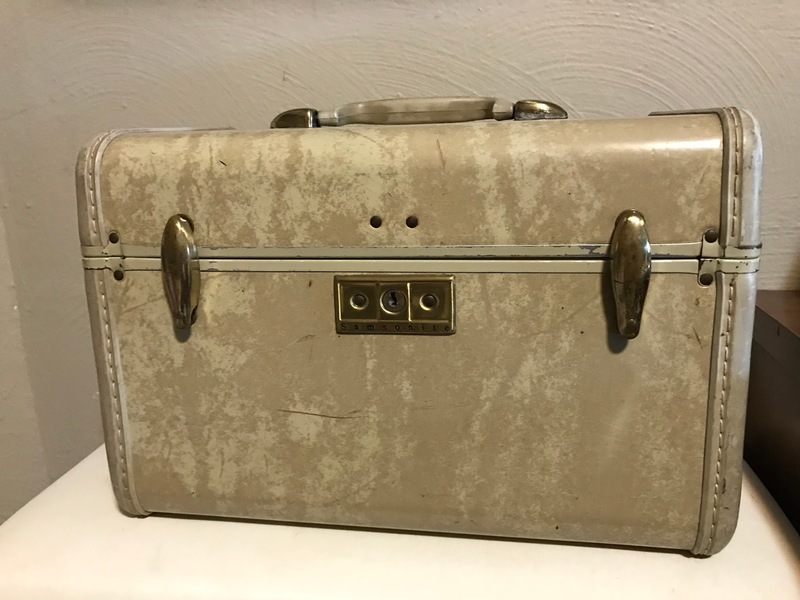 These cases were meant to last a lifetime and built that way, but it didn’t take very long for suitcases to modernize for the masses and drop in price, along with easier cheaper and more convenient transportation. Cars hit the road big time by the 1920's and planes weren’t far behind. Luggage had to be rethought and slimmed down to let it ride neatly in trunks and cargo holds alike. 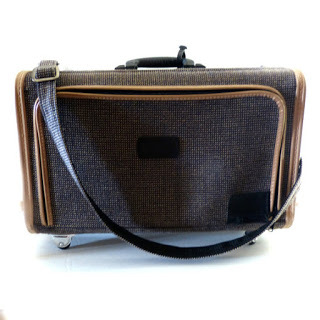 These days suitcases are not meant for a lifetime of use, sadly most are part of the planned obsolescence pattern we live with now, and designed and made only for shelf appeal. 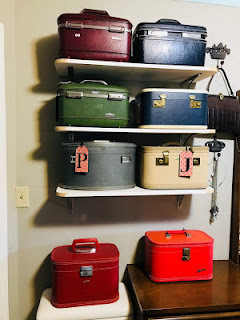 The good news is that lots of great well-made 20's-70's vintage luggage is still out there, available, and holding up just fine. The next big thing in luggage land was the successful introduction of wheels on suitcases in the 1970's. The first years with wheels on bags were not quite the spinning-easy-to-pull-in-any direction luggage we all love today. Wheels were a natural as airports got bigger and people had to drag luggage further. Add to that the price to check bags skyrocketed, and the end result is the modern carry-on cases we use now. 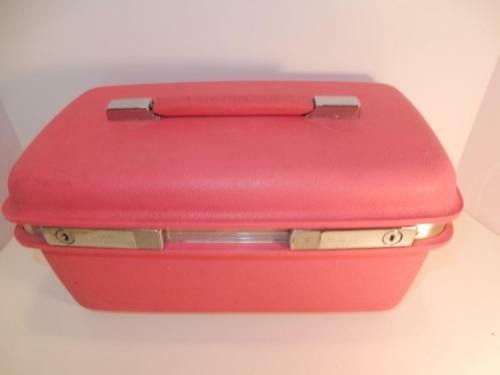 Other changes saw zippers instead of clasps and closures, lots of soft sided bags and suitcases shaped like a big upended shoe box, because just like every era before, the product is shaped by the customer’s need. In this case rolling easily and fitting snugly in small spaces. 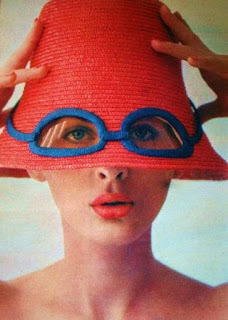 In the 1960s, vinyl and modern materials showed up instead of just leather. This innovation let color be a big part of what was going on travel-wise. 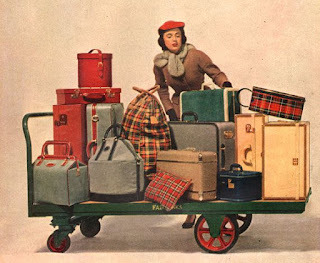 Luggage sets were mostly marketed to women who loved the brighter palate. 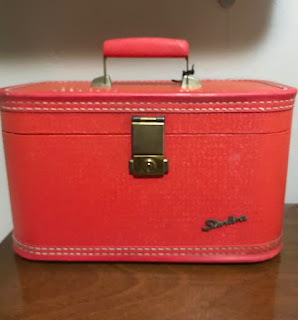 Brides often received a matching 3 or 4 piece set of luggage as a gift in the 1960s and 1970s because although still expensive luggage was becoming affordable for the first time. 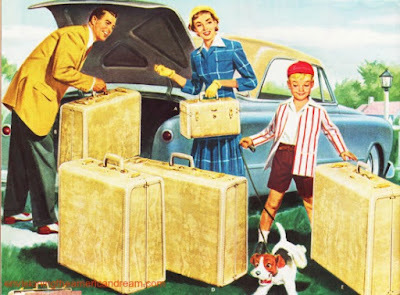 Prices came down with manufacturers working to capture this new market and jockeying to make cheap sturdy good looking suitcases, meaning the youngster headed off to college could have her own new luggage instead of Aunt Hermione’s old bag in the attic. Luggage became a niche market too, with wig boxes, dog carriers, small cases big cases and really big cases in every color under the rainbow. Some luggage is a really big deal, like Louis Vuitton luggage. Louis started out as a Luggage Packer for rich ladies in France. 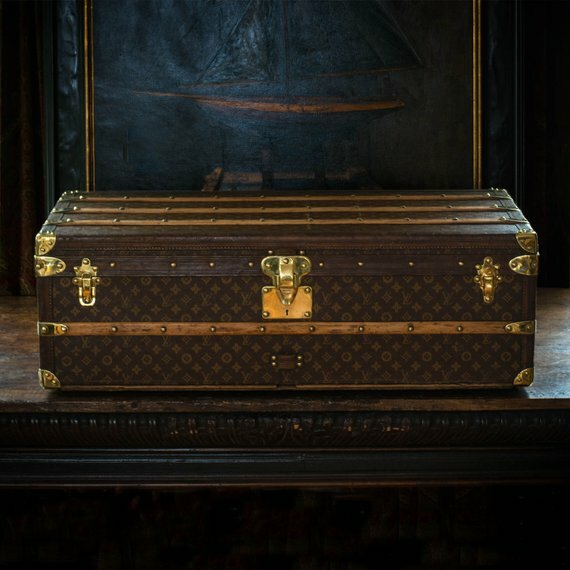 He made his reputation taking care of the travel needs of Napoleon III’s consort, Empress Eugenie and parlayed that into his own luggage store in 1854 creating bespoke trunks and suitcases. His work was wildly popular and immediately imitated forcing him to change the fabric/leather patterns twice before his son trademarked the now famous Louis Vuitton monogram pattern. (https://en.wikipedia.org/wiki/Louis_Vuitton more info for the curious fan). OshKosh luggage and trunks, specifically the Chief line, are worth a lot of money and sometimes called the American Louis Vuitton. 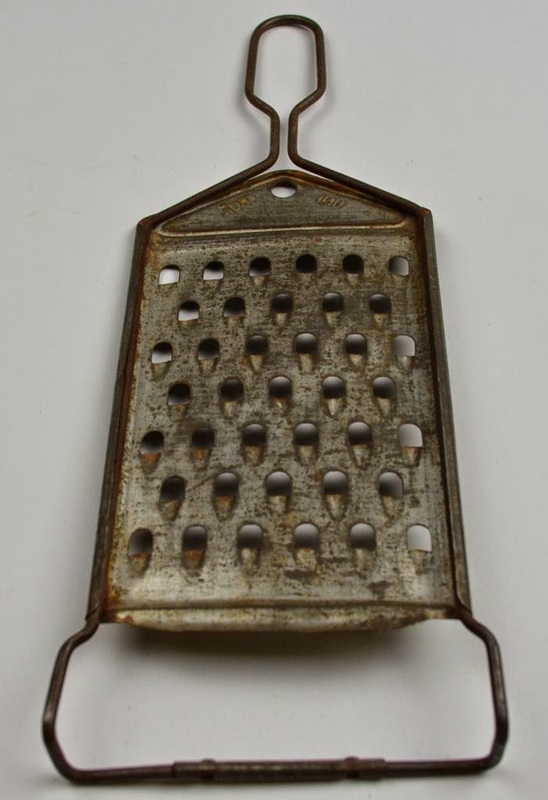 They went out of business in the 1950s and are highly sought after these days. The design was a complete accident. OshKosh Trunk company in Wisconsin had a warehouse full of striped canvas just sitting around after the Spanish American war. They put it to work covering suitcases and had planned to paint it. A buyer at Marshall Field’s in New York convince them to let it be and a star was born. 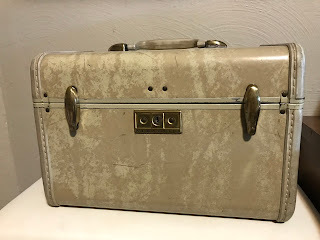 Many American companies made luggage from the 1900s to the 1970s, but some of the stars of the vintage suitcase scene are Samsonite, founded by Jesse Schwayder in Colorado in 1910. The decision was made to use Samson the strong man to name their affordable, durable, incredibly strong line of luggage, in business to this day. 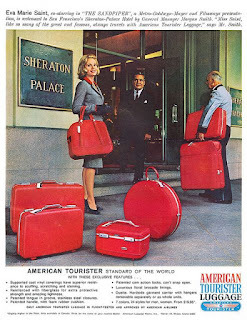 American Tourister came along in 1932, founded by Sol Koffler, whose stated goal was to make the sturdiest and least expensive suitcase in the world. AT was acquired by Samsonite in 1993, and is still a strong American brand. My favorite has to be Skyway, founded in Seattle in 1910 and the largest privately owned luggage supplier in the world. Skyway is owned by the same family that founded it. They were renowned for chrome plating their hardware and their innovative use of vinyl trim back in the day. 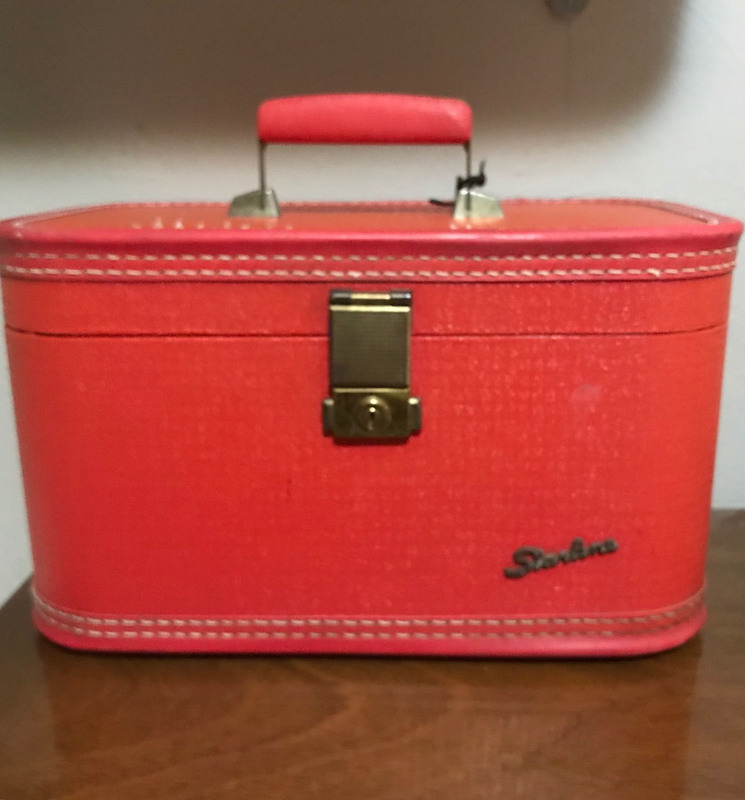 Think about using vintage suitcases for great pieces to store things in. I have a small house and I use my collection to hide sewing materials, greeting cards, sketch books, colored pencils, winter scarves, and more. If you love luggage, there are great patterns and ideas on line for repurposing suitcases to make end tables and display pieces too. Finders Keepers in downtown Olympia, where I hang my vintage selling hat with about 45 other dealers has lots of gorgeous luggage to choose from. I’m at the point myself that if I add to the collection something has to go, but someday I will find that elusive pink train case, or maybe I'll stumble over a set of OshKosh Chief pieces in somebody's granny's garage. Hey, I can dream right?